Are you just a woman, or just a mom, or just a messenger? That idea or feeling of insignificance just suffocates us, making us grasp for air, for light, for life. Are we not enough or is that a bold lie? In moments like these I think of the story of the leaky bucket as it helps to give insight into our value. “In the very olden times, there was once a great queen. This queen had many, many servants to take care of every task. One particular servant was responsible for bringing water from the well to the queen’s table. However, it was a long journey from the castle to the well from which fresh, clean and pure water could be obtained. As this was the time before cars and other convenient machines, the servant carried two buckets – one attached to each end of a long stick – to transport water back to the castle. One of the buckets was new – it shone in the sunlight and it was perfect in every way. The other bucket was older and it had a small hole on one side, which caused water to leak from it onto the ground, along the road back to the castle. Thus, whenever, the servant arrived back to the castle, although he had filled two buckets of water, he had only one and a half to present to the queen. This caused the leaky bucket great distress. Twice a day when the servant picked up the buckets to go to the well, the older one would look longingly at the new one, “Oh, why can’t I be as shiny and flawless as the other?” the bucket would bemoan. The leaky bucket would cast envious looks at the new bucket since not a single drop fell from its new, glistening metal. It tried every possible way of shifting its weight, of rotating its sides to minimize the leakage, but all to no avail. It could retain no more than half of bucket through the long walk back to the castle. The servant was very wise (sometimes wisdom lies hidden in places where we don’t expect it). He said to the bucket, “Look down. Look below you on the path to the castle, the path upon which you leak your water.” The bucket at first was too ashamed to look and see drops of precious water scattered on the ground. When it finally looked, however, it noticed a thick row of beautiful flowers – so many lush, blossoming varieties – lining the path with vibrancy and beauty. 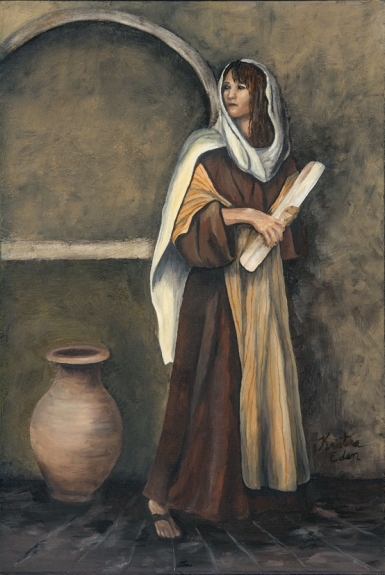 In this painting Phebe was a messenger for Paul. Even though Paul never personally ministered to the saints in Rome, he sent the saints’ instruction and encouragement in the form of letters via Phebe, a great woman of faith. Phebe is looking over her shoulder in fear of being discovered and losing the letter and her life. She chose to do what she needed to do in spite of her fear or stumbling blocks. Through her efforts the saints received instruction and this also gave us the book of Romans. So how important is just a messenger? The small pieces of paper that she delivered changed the world. It brought peace to those who needed it. Her contribution is still bringing light and life to our world today. So was she just a messenger? Every one of us has a contribution to give. What may seem small may actually have great impact. And what may slow us down can be overcome. Nobly carry your life giving water to where ever it is needed, even if you just drip it along your daily path.